Looping Maneouvre with Jill Clendon, Alex Monteith, dual channel video installation with stereo sound, 17mins, 2008 from Alex Monteith on Vimeo. Jill Clendon racing at 2008 NZ National Motorcycle championships, Formula 3 class, Pukekohe Racetrack, Auckland. Dual-camera shoot recorded during qualifying. The art-work is a simultaneously recorded front and rear view of the full qualifying round from the pits, to starting grid, laps and return to the pits. The work is installed as a dual-channel video installation with stereo sounds. Each projection is 4 metres (w) x 3 metres (h), total dimensions; 8 metres x 3 metres. Exhibited as part of Need for Speed solo show St Paul St Gallery, 2008. 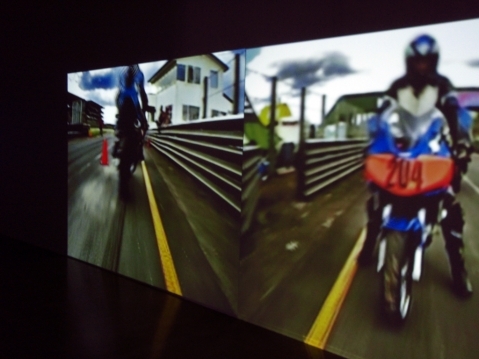 Jill Clendon, a multiple collaborator for on-board motorcycle projects with Alex Monteith, rode her Suzuki GSXR 600 to the exhibition opening where it was displayed for one night. Colemans Suzuki, Auckland, was the exhibition sponsor.